While out on a Twin Cities home inspection the other day, I came across a sump pump that was hard at work. The pump was doing exactly what it was designed to do: pump out water that had collected in the home’s sump basket. If you are unfamiliar with sump pumps and how a drain tile system works as part of a home’s Water Management System, it is really quite simple. Piping that has been pre-drilled with holes sits below the slab along the perimeter walls of the basement. Water that drains along a home’s foundation enters the pipes (water will find the path of least resistance) and flows downhill to the sump basket. When the basket fills with water, a pump with a float mechanism kicks on to discharge the water to the home’s exterior. Typically, a sump discharge hose is attached to the piping where it exits the home. This allows the discharge water to drain far enough away from the home that it prevents an endless cycle of having to pump out the exact same water that has recently been expelled from the home. Now a word about that discharge hose at the home’s exterior. 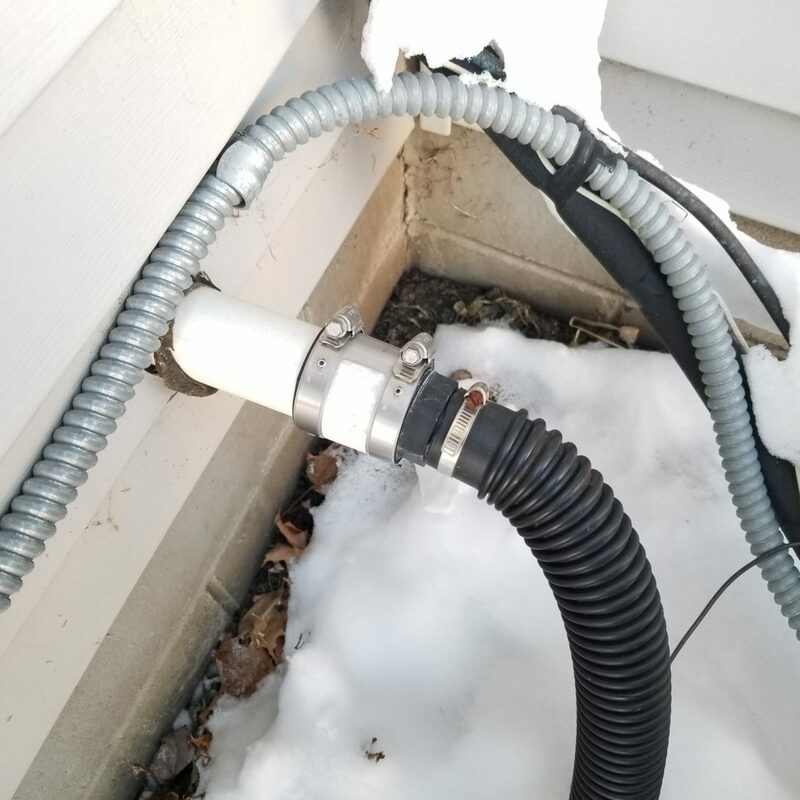 If you live in a colder climate where winter temperatures dip below freezing, that discharge hose needs to be disconnected for wintertime. On that recent home inspection, the homeowner had failed to disconnect the hose. Looking outside at the back of the property, I found the end of the hose buried in snow and frozen solid. While the sump pump was doing it’s job, with the end of the hose blocked by ice, there was nowhere for the water to go. That explained the overheated pump and the steaming water in the sump basket. Who knows how long that pump and been running and how much longer it would be until the pump totally burned out. Needless to say, it wasn’t designed to run constantly and pump failure was going to be a certain outcome of this oversight. As a rule, in colder climates discharge hoses should be detached in late fall once there is a real chance of freezing and then reattached in early spring when freezing temperatures are no longer a possibility. Failure to do so is going to lead to costly repairs: either replacing a burned out pump that has been running non-stop or even worse, repairing a water damaged basement. While we are getting closer to the end of winter in Minnesota, we still have a ways to go. If you never took the time to disconnect your discharge hose last fall, go out and do it now. Better late than never. Just don’t forget, come spring time, to reattach that pesky hose.